Recently I’ve turned into a bit of a nail polish addict. As I don’t usually wear very many colours in my makeup routine, I like to experiment with nail polish. A brand I’ve been loving lately is Nails Inc and after trying their malibu inspired polish, Mali-Woo-Woo, I had to pick up some more. A tad more expensive than your average polish I’ll admit but I waited until my birthday before I could treat myself to a few more shades I’ve been lusting after. Here’s some of the shades I have in my collection and what I think of them. Of course the first one has to be Mali-Woo-Woo which I dedicated a whole post to a little while ago along with a matching cocktail recipe based on the polish. It’s a gorgeous hot pink shade which applies opaque with one swatch and lasts without chipping for a long time. The shade was actually part of the Malibutique campaign so it’s not available to buy in stores or online but if you're looking for an alternative, Nails Inc’s Shoreditch or Barry M’s Pomegranate are very very close. If I'm purchasing more expensive nail polish, I like to try and make sure I pick up colours that are a little different to what I already own. Portobello is a neon pinky/peach colour so it’s been great wearing it during the summer. The only issue I have is that it applies very sheer and compared to the other Nails Inc polishes, this one is probably my least favourite. It’s definitely something different but I think the formula lets it down a bit. 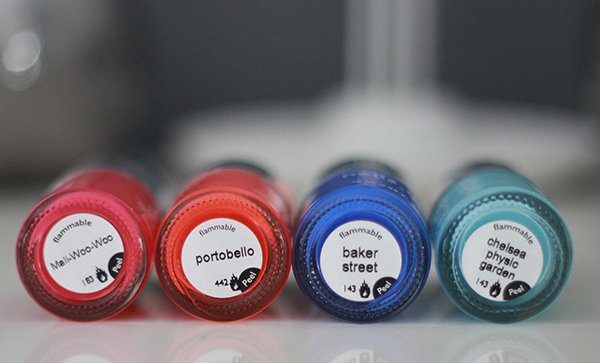 The one Nails Inc polish I was dying to try the most is definitely Baker Street. I can see why it’s one of their most popular shades. The colour is a deep cobalt blue with a slight neon tint to it which looks amazing against every skintone. Cobalt blue has been everywhere lately, I think it’s an easy shade to pull off so I've been taking every opportunity to apply it and match it to my outfits. It also has a sort of semi-matte finish which I love but every now and then I'll apply a topcoat for a glossy finish. If you're looking to try a Nails Inc polish but don't know what to try first, get this one. As it was summer, I decided I would pick up one of their summery shades, Chelsea Physic Garden which is a gorgeous pastel blue, perhaps with a slight tint of green. I've definitely been loving my blue shades and coincidently it matches with my room decor. It applies with a glossy finish and doesn't go gloopy or thick on application like most light colours do so it’s the perfect pastel shade. 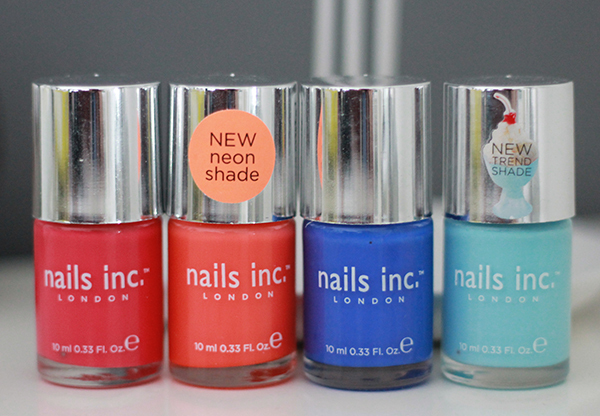 If you are looking to try out a few Nails Inc shades, I’d really recommend them. I’ll admit, the formula does have a bit of a strange scent but the shade range, staying power and application makes it definitely worth it. I’d also encourage you to take a little look at the QVC UK website before buying as it’s probably the most affordable option I’ve come across. They have lots of sets for around £25 for 4-7 full sized polishes so it’s definitely more affordable than buying them individually at £11 each and unlike everywhere else that sells beauty in the UK, you can actually return them if you don’t like them. I haven’t settled on a combination yet for a future purchase but I’m definitely keeping an eye out! With a new autumn wardrobe means new nail polish too, right? What nail polish shades have you been loving?